On asking an old man directions to the nearest men’s toilet. To Bob Dylan and the person who wanted me to be more accurate with my titles. An old man reflected on this part of town. But the toilets by the railway station are not to be trusted. The old man bit his lips as he spoke and went a little red in the face. He folded his arms and sat down on a bench. The timber slats creaked under his weight. But here, where we were, no one moved. The sidewalk was wet from where the shopkeeper hosed it. Of sweat and urine radiated from his body. To be there all day. The old man went on and then spat into the gutter. “But he died last year. It’s changed my day a lot; I do so much more thinking now. And I headed across the street to the park. In the men’s block, I find a young man collapsed on the floor. As if he is hugging it to him on those cold tiles. He wears a hood over his blond hair, and his face is pale and marked with acne. I wonder if it’s drugs. I leave those toilets and go back to my car. and wonder what he’ll make of the excitement to come. 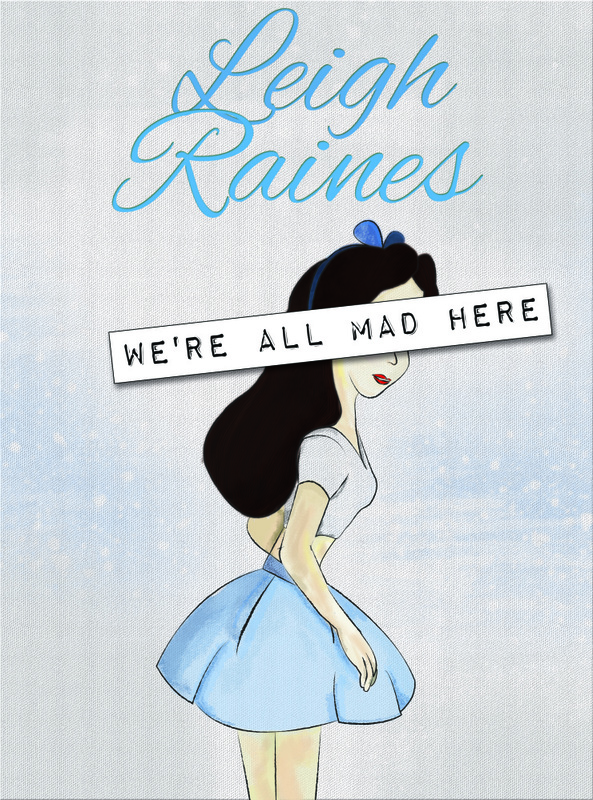 Leigh Raines ‘We’re All Mad Here’ release and interview. Jade Thompson had the kind of adolescence you would find in a Norman Rockwell painting. But at 19-years-old when her seemingly normal life is flipped on its head, she’s forced to take a closer look at the relationships in her life and the decisions she has made. It feels as if she has fallen down a rabbit hole. As she returns to college and stumbles through her new reality, she finds herself more than a little lost. With the help of her three closest friends, we spend the year with Jade through her ups and downs where she discovers everyone is a little bit mad in the world. 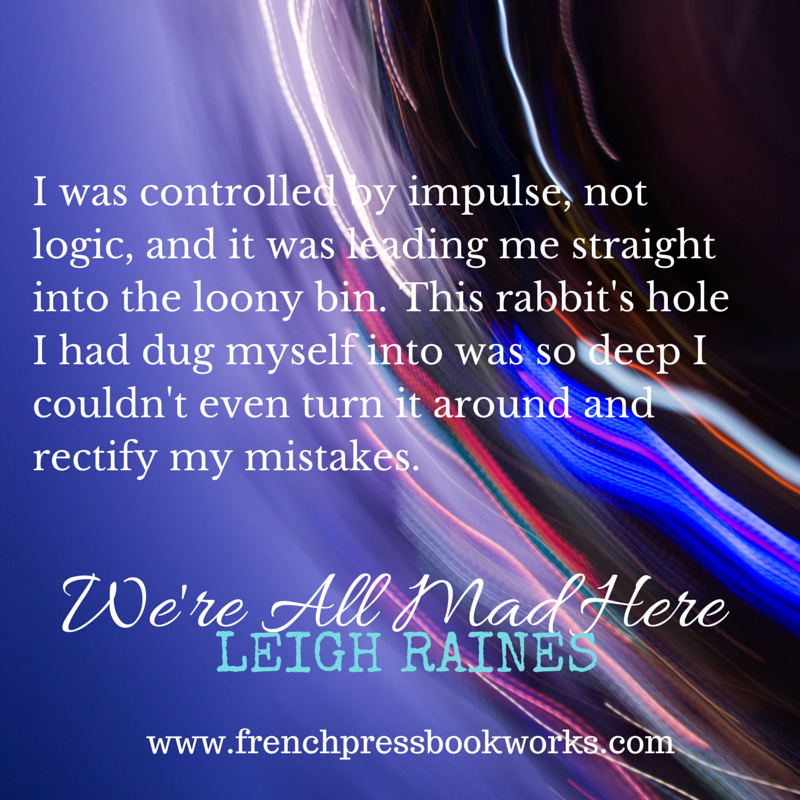 Please have a look at http://www.Leighraines.com to explore this author’s ideas and works. She was kind enough to answer a set of my questions and to coincide with the books release, I found out a little more about Leigh. L: I’m just a girl, who wrote a book years ago not knowing what I’d eventually do with it….and now it releases this week and I’m altogether excited and terrified. A little about me? Born and raised just outside of Manhattan, big family, went to Lehigh University, studied Journalism. Love all things pop culture, work for a TV critique website, I love the way people use creative mediums to tell stories. Favorite shows in the world are Friday Night Lights and One Tree Hill. My French bulldog is named Minka for FNL. Favorite books, is a much hard question! 2. What do you like to read? L: I read a lot of indie authors, mostly New Adult, young romance. I do read the popular best-seller stuff and I like some historical fiction and memoirs. I love a good love story. 3. What are you reading right now and what do you think you will read next? L: I tend to read more than one book at once, especially because I have the nasty habit of staying up all night to finish a book I’m really into. So before bed you’ll find me reading “The Andy Cohen Diaries” because it’s funny, but I’m not addicted to finding out the ending. Last few: “The World According to Rachel” by Layne Harper, “The Before Now and After Then” by Peter Monn, “All I want (Alabama Summer)” by J. Daniels, “Captivated by You” by Sylvia Day. Next: “Maybe Not” spinoff of an awesome Colleen Hoover book called “Maybe Someday” and the “Real” series by Katy Evans, because I keep hearing about it. 4. Why do you like to write? L: It’s therapeutic. I love telling a story. This book I wrote started as a cathartic thing for me and then I wanted to have a little fun with it. I also do weekly TV reviews. I like to just break down a story and discuss it. 5. Tell us about where you come from and where you live now. L: I’m from Rockland County, New York and now I live on the Upper East Side in Manhattan with my boyfriend and dog. My family has a house on coastal Georgia that is a second home and I love. The only other place I’ve ever really lived was Eastern Pennsylvania for college. 6. If you could invite any person, alive today or from history, to a dinner party who would you invite and why? L: Such a hard question, especially narrowing it down! Author wise: Jacqueline Susann because “Valley of the Dolls” was such a scandal and it also made me want to spice up my own book. I feel like she’d have a lot of juicy tales. I’m such a huge TV nerd so I’d want to meet Connie Britton and Sophia Bush, two of my favorite actresses who are also really philanthropic and inspiring woman. From a personal standpoint, I never met my grandfather whom I was named for and my boyfriend’s mother passed away 9 years ago and I want to meet the woman who raised this man I love so much. 7. What advice can you give to people trying to achieve their dreams? L: Don’t settle and get comfortable. Rejection is normal. If your dreams don’t scare you, they’re not big enough. 8. Can you tell us about the new book you have coming out and about your inspiration? L: Some personal experiences inspired my book, but there was also a motto of “All that glitters is not gold.” Someone can have a normal great life and meltdown anyway because that is just life! I think mental health is a really important conversation to be having, especially with today’s youth. Also when I started writing this probably a decade ago, there was such a gap in the publishing industry without the New Adult category. College age is such a formative time. I wanted to delve into that. 9. Can you give us a quote from your favorite book? Leigh Raines ‘We’re All Mad Here’ French Press Bookworks. Released December 10th 2014 available electronically, online or through any good bookstore.